In one of my projects where we are using the Content Delivery API from Episerver, we also have some custom logic in the templates for some Ajax posting. This will respond with a 405 error with the message HTTP verb used to access this page is not allowed. This might not be best practise to shoot XHR requests to the same request and manage the response in the same code that also handles the HTML rendering, but that is how it was build back then. Looking into the binaries, I managed to find that this is caused by something in the EPiServer.ContentApi.Cms.dll binary. I used DotPeek to look what’s going on in that file and could see that on initialization, the ContentDelivery attaches to the RoutedContent event on the IContentRouteEvents interface. When content is Routed the method ContentApiRouteService.ShouldRouteRequest is used to check whether or not this request should be rewritten to use the ContentDelivery API instead. The default implementation of ContentApiRouteService checks whether the Accept Header contains “application/json”. Which is the case for of our current implementation. With rewritten I mean that instead of the normal request destination which usually is your WebForms ASPX template or MVC Controller, the request should be routed to the ContentDelivery API at /api/episerver/v2.0/. As we are depending on the request to reach our template, we need to disable this. The best way I could find is to override the ContentApiRouteService .ShouldRouteRequest method. I replaced it with a method that just returned false. I never want the request to be routed to the ContentDelivery API. When I use the ContentDelivery API, I use the endpoint found at /api/episerver/v2.0. You can find how I override the implementation of ContentApiRouteService at GitHub together with how I replace it in the IoC container using a Configurable Module. As you’ve probably heard, Episerver is creating a Headless CMS API called “Content Delivery API“. With this, you can get, list and search (requires Episerver Find) content from Episerver in a JSON format. Matthew Mols has some blog posts about how to get started: Getting started with the Episerver Content Delivery API and Add HTTP Caching to the Episerver Content Delivery API. I just started looking at it myself and found some basic ways how to tweak the output of the API when it comes to Content and Properties. 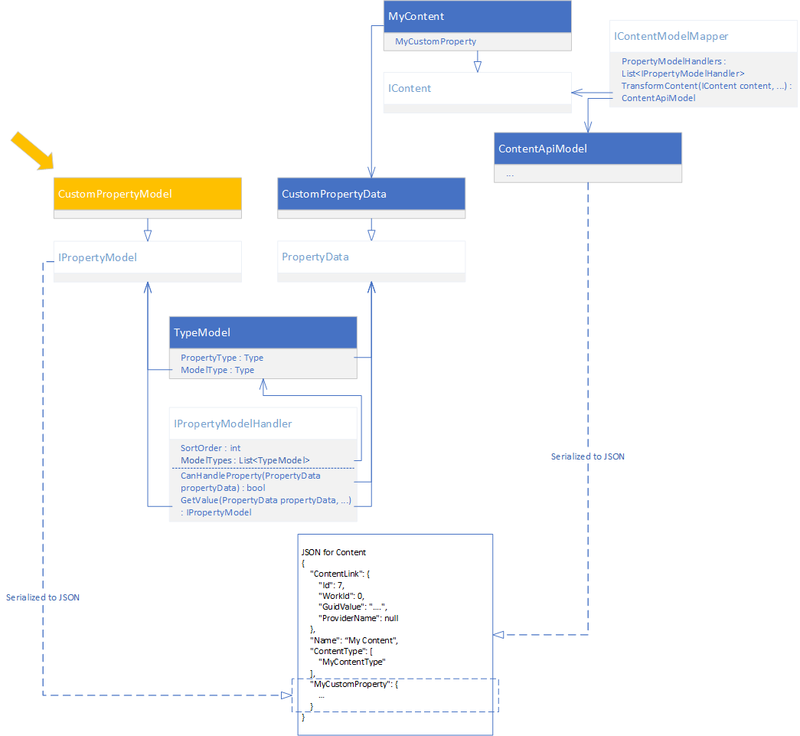 A simplified description of what you get from the API is a JSON serialized ContentApiModel. ContentApiModel is basically a copy of the Content populated depending on what content interfaces your content implements. Also, for each PropertyData in your Content.Property try to find a registered IPropertyModelHandler that has an TypeModel that can handle the Property Type. Type PropertyType Which Property Type this TypeModel can support. For example PropertyContentReference, PropertyXhtmlString etc. Type ModelType The type of the class that takes care of the rendering. Needs to implement the Interface IPropertyModel. string ModelTypeString The name of the PropertyModel, normally the same name as the name of the ModelType. This is a ContentDelivery version of the PropertyData. This is what is rendered as a JSON for each Property on your Content. For example the PropertyNumber would be represented by NumberPropertyModel. The NumberPropertyModel has a Value (the numeric value of your property) and a PropertyDataType which usually is the name of the value type (in this case “PropertyNumber”). How do I add Custom Properties or replace the JSON output? For example if I’d be using ImageVault including their custom Property Types, the property won’t be displayed as no IPropertyModelHandler that can handle PropertyMedia. Instead of creating your own implementation of IPropertyModelHandler, you can just add more TypeModels to the existing one in an InitializationModule. Which isn’t really helpful since ImageVault images are not served as content so we can’t use that ID with the ContentDeliveryApi. We need to add a little extra information so let’s create a new PropertyModel that will wrap the MediaReference, but also add a Url to the image. This is the same procedure but instead of creating a new TypeModel, just replace the value of the ModelType property with an own Type in the InitializationModule. Check an example of InitializationModule to add or replace properties. string Name The name of the Property Model, usually the name of the Episerver Property type. string PropertyDataType The name of the Property Model, usually the name of the Episerver Property type. What I can see when reflecting Episerver’s code, it seems like your implementation also need a constructor with a parameter with the PropertyData. For your convenience, Episerver have a base class for this: EPiServer.ContentApi.Core.PropertyModel<TValue, TType> where TValue is the value you should output in your JSON, and TType is the PropertyData. Check some examples where I’m serializing the Property value or even serializing with extra information. As the PropertyModel is serialized to a JSON, all properties on your implementation will be included in the result (except if you decorate the property with the JsonIgnore attribute – see below). If the output of your Custom Property depends on personalization, implement the IPersonizableProperty. The interface only requires a Property called ExcludePersonalizedContent, but it seems like your implementation need a constructor with the PropertyData AND a boolean. For your convenience, Episerver also have a base class for this: EPiServer.ContentApi.Core.PersonalizablePropertyModel<TValue, TType> where TValue is the value you should output in your JSON, and TType is the PropertyData. IExpandabeProperty is used for properties that where you can return a simplified set of data for the initial API Request, so that the Client can make further requests to dig deeper into the data. Note that expanding will only dig through the first level of nested Content. If you have Properties on your ModelType that you don’t want to be included in the JSON output, just decorate it with the JsonIgnore Attribute. I hope you learned something new about Episerver’s Content Delivery API. It’s still kind of new and the documentation is not very good yet. If you have any tips and tricks, feel free to blog about it and give me a shout! Always nice learning something new!